The General Awareness Section of Banking Exams covers numerous sections in it like Banking Awareness, Static GK, and Current Affairs. But the most important thing that you might have noticed is that both the Banking Awareness and Static Awareness questions asked in the General Awareness Section are based on Current Affairs only. The questions on Static and Banking Awareness are related to the countries, events or anything that has been in news for a while. Apart from the GA Section, an excellent knowledge of current news also helps you deal with the PI (Personal Interview) more efficiently so you do not give a mumble jumble answer to the interviewee's simple questions. 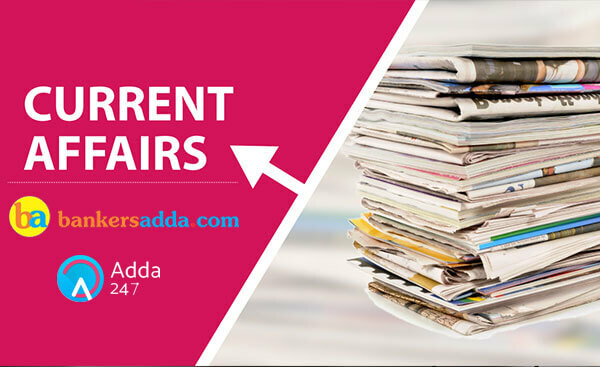 Here is a quiz on Current Affairs to let you assess your Current Affairs Knowledge. Q1. Prime Minister Narendra Modi left for his three-nation visit to three of the Gulf countries. Which among the following is not one of them? Sol. Prime Minister Narendra Modi left for his three-nation visit to Palestine, the United Arab Emirates (UAE) and Oman. This is the first ever visit by an Indian Prime Minister to Palestine, and Prime Minister Modi's second visit to UAE and first to Oman. Q2. The first Khelo India School Games concluded recently in New Delhi. Which among the following state has topped the list? Sol. The first Khelo India School Games concluded in New Delhi with sports powerhouse Haryana topped the overall medal tally. The state won 102 medals which include 38 gold and 26 silver. Q3. Name the newly appointed Managing Director (MD) & Chief Executive Officer (CEO) credit card issuer SBI Card. Sol. SBI Card, the country's second-largest credit card issuer, has appointed Hardayal Prasad as new Managing Director (MD) & Chief Executive Officer (CEO) of the company. He has replaced Vijay Jasuja. Q4. Name the lender that has recently launched its new Sonic Identity, which is essentially a musical logo called 'MOGO', as part of its branding initiatives. Sol. IndusInd Bank launched its new Sonic Identity, which is essentially a musical logo called 'MOGO', as part of its branding initiatives. Q5. What is the ranking of India in the International Intellectual Property (IP) Index among 50 nations, according to the US Chambers of Commerce report? Sol. India has increased “substantially” its score in the International Intellectual Property (IP) Index, ranking 44th among 50 nations, according to the US Chambers of Commerce report. Last year, India ranked 43rd out of 45 countries in the Index. Q6. Defence Minister Nirmala Sitharaman has constituted a 13-member advisory committee to monitor and expedite capital acquisition projects for the modernization of the armed forces. The committee will be headed by ________________. Sol. Defence Minister Nirmala Sitharaman has constituted a 13-member advisory committee to monitor and expedite capital acquisition projects for the modernisation of the armed forces. The committee will be headed by Vinay Sheel Oberoi, former secretary in the government. Q7. The National Highways Authority of India (NHAI) will start a pilot project called ____________ on the Delhi-Mumbai Highway to study and implement the ability of the system in the country. Sol. The National Highways Authority of India (NHAI) will start a pilot project called "pay as you use" on the Delhi-Mumbai Highway to study and implement the ability of the system in the country. Q8. Which among the following Railway Zone has become the first railway zone in the country to complete 100% LED lighting at all the stations under its jurisdiction? Sol. The South Central Railway (SCR) has become the first railway zone in the country to complete 100% LED lighting at all the stations under its jurisdiction. The SCR has been on the forefront of adopting energy conservation measures. Q9. Which among the following country has topped the International Intellectual Property (IP) Index, according to the US Chambers of Commerce report? Q10. Muscat is the capital city of ___________. Sol. Oman Capital- Muscat, Currency- Omani rial. Q11. The Competition Commission of India (CCI) has imposed a fine of around Rs. 136 crores on which of the following tech giant for unfair business practices in the Indian market for online search? Sol. The Competition Commission of India (CCI) has imposed a fine of around Rs. 136 crores on search engine major Google for unfair business practices in the Indian market for online search. Q12. Name the lady who has been appointed as the International Cricket Council's (ICC) first-ever independent female director. Sol. PepsiCo Chairman and CEO Indra Nooyi has been appointed as the International Cricket Council's (ICC) first-ever independent female director. Nooyi will join the cricket body in June 2018 for a 2-year term. Q13. Which among the following group is the owner of Mumbai-headquartered IndusInd Bank? Sol. R. Seshasayee is the Chairman of IndusInd Bank. It Headquarters in Mumbai. Its Owner is Hinduja Group. Q14. Union Minister of State (IC) for Power and New & Renewable Energy, Shri R.K Singh, launched a Web-based monitoring System and a Fly Ash mobile application named __________. Sol. Union Minister of State (IC) for Power and New & Renewable Energy, Shri R.K Singh, launched a Web-based monitoring System and a Fly Ash mobile application named ASH TRACK. Q15. Who is the present chairperson of the Competition Commission of India (CCI)? Sol. Devender Kumar Sikri is the present chairperson of the Competition Commission of India (CCI). Its Head Office is in New Delhi.